First impressions count. The outside appeal of your home has a great influence in how your property is viewed. Having a functional entrance, one that stands out from the rest, is just one way to increase the aesthetics of the landscape. A perfect way to do this is with the addition of an aluminum driveway gate. Driveways exist for very realistic reasons. A driveway is just one avenue between outsiders and your home. When a driveway gate is installed the access to your property is limited to only those individuals who you deem allowed to enter. We all want to keep our families safe especially when they are under our roof and an aluminum driveway gate is just one of the ways in which this is done. Thankfully the installation of a gate doesn’t have to sacrifice the beauty of your home and landscape. As with many purchases that can be made today, driveway gates can be bought online. Purchasing larger scaled items like driveway gates online is not only easy but ultra-convenient as they are delivered directly to your home. When an aluminum driveway gate is delivered to your home they will come with easy-to-assemble panels and posts. Included will be instructions on assembly and installation. 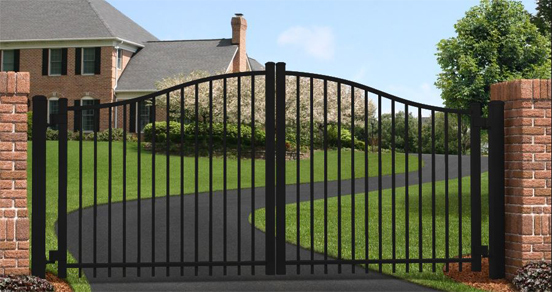 There are several styles and types of driveway gates to choose from. 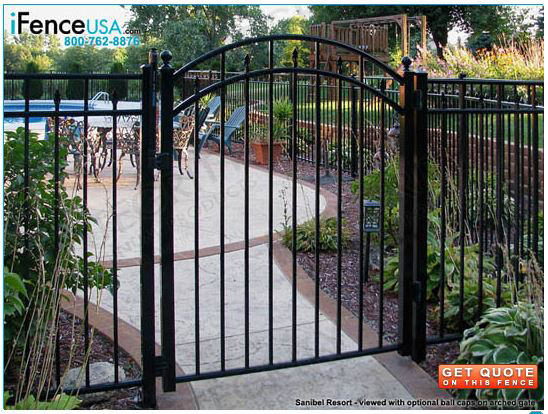 An aluminum gate can easily be chosen to coordinate with the style of your home and landscaping. 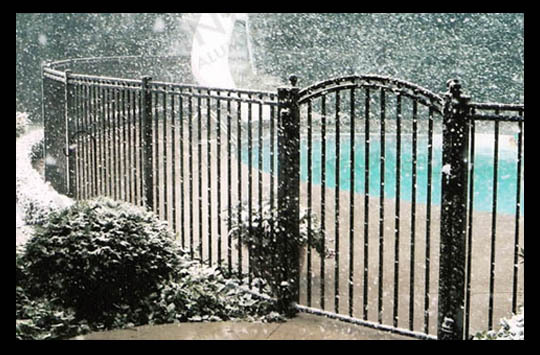 There are several ways in which you can make your new aluminum driveway gate stand out. As you are shopping for an aluminum driveway gate you will start to notice that there are several different options that can be included to the gate to customize it just for your space. 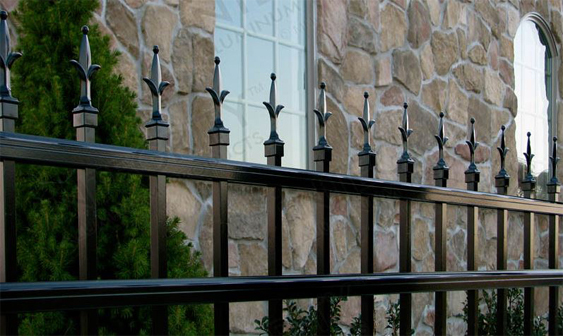 Swing gate posts are a popular example of one way to really enhance the grandness of an aluminum driveway entry gate. Stone and brick pillars on either side of the driveway are just one way to add depth and grandness to an ordinary driveway gate. Inlays installed onto the aluminum driveway gate panel are another way in which you can enhance your new gate. A custom inlay can be created in a number of different designs, from scrolls, initials, and emblems are all popular inlay options. Many times, commercial driveway gates will be enhanced with a business logo to enrich the visit of the property. The landscaping of your home including flowers, shrubs, trees, vines, and planters can be used to create interest to the entrance of your home. Aluminum driveway gates are magnificent on their own but with the right landscaping a statement can be really made. 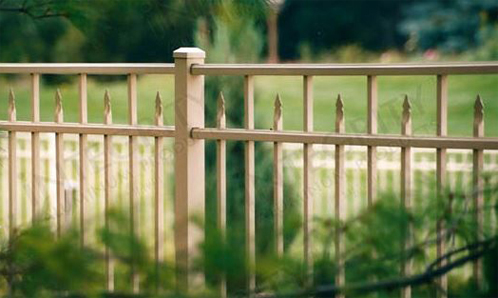 Similar to aluminum fence panels, aluminum driveway gates can be ordered in a variety of colors. 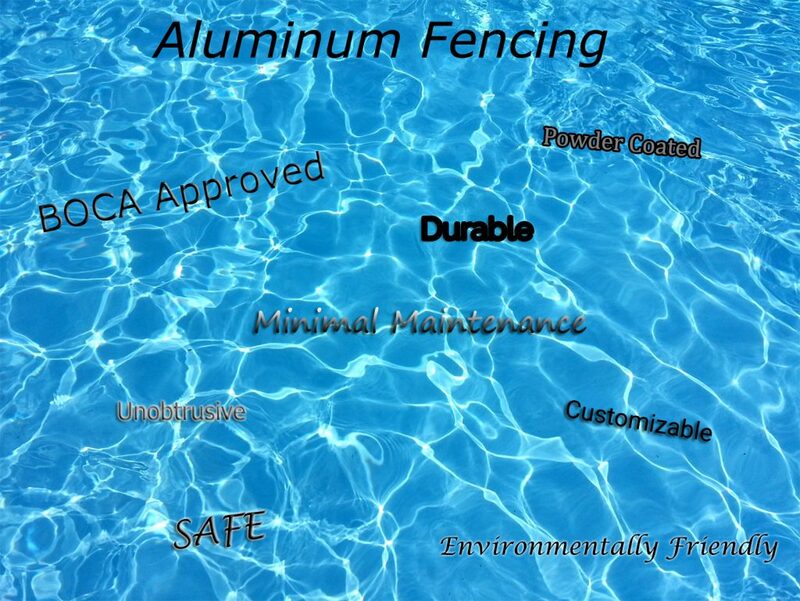 More often than not the gate that is chosen will match the color of the aluminum fencing around the perimeter of the landscape. 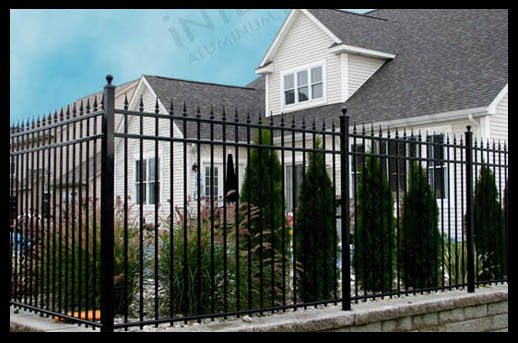 Aluminum driveway gates are often ordered to match the details of the aluminum fence such as detailed handrailing, spear tops, and decorative finials. No one wants to enter their property in the dark. Adding in some attractive lighting fixtures on the posts or the driveway perimeter creates a welcoming, safe entry and exit to the home. In order to create a cohesive look, lighting can be installed to lead all the way to the main entrance. With a few minor choices a generic aluminum driveway gate can be turned into something extraordinary.